Focused! Dedicated! EcoMech heating and air professionals provide sustainable energy heating and air solutions under one roof. 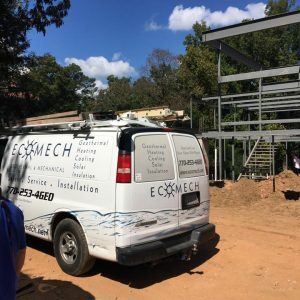 For over ten years EcoMech Geothermal & Mechanical has been providing heating and air solutions and is continually ranked as a leader by its customers in the heating and air industry. We are the trusted referral choice for hundreds of home owners in the Atlanta and surrounding area. We offer the best engineered solutions for a “high performance home”​ with the best experts in the field! Mission To provide the highest level of customer service and stay a leader in sustainable whole home energy solutions to meet the Atlanta home needs of our valued customers in the communities we serve. Our technicians have extensive training for geothermal installations, repairing, and to stay up to date on the latest information in the industry! Our service techs take continuing educational training in all aspects of HVAC. We use only the top of the line equipment for your installation. We proudly service, maintain, and offer preventative maintenance contracts for all makes and models of air conditioning equipment from Geothermal to Conventional. Call for Geothermal or any type of heating and air service today! EcoMech is your best choice for heating and air service. Our expertise in geothermal heating and cooling is unmatched! Furthermore, for the South East we are a top geothermal installer for Georgia and we hold an impeccable record of satisfied customers. As a result, we have installed more than 100 geothermal heating and cooling systems throughout Georgia and in doing so, we work with any budget in front of us. So, your dream of owning a geothermal system can happen if you call us today. Our team has combined experience of over 40 years in Geothermal heating and cooling system installations for Atlanta, GA., and surrounding areas. We have installed many geothermal heating and cooling systems around the Atlanta, Ga. metro area, Columbus, Ga., Macon Ga., North Ga. Mountains, Florida Panhandle, Anniston, Al., Valley, AL., and many other locations around the Southeast United States. Along with geothermal heating and AC systems, we can also provide many other smart energy solutions for your home or commercial building uses. Geothermal energy is a great way to keep your home cool in the summer and warm in the winter, plus there is the benefit of adding additional value to your home. If you would like to learn more about the benefits of having a geothermal system installed in your home then give us a call today and we’ll be happy to discuss your project with you. When you ask a “quality home builder” for recommendations on a heating and air guy… Hands down, they will tell you ECOMECH. We are widely known in the Atlanta market as the “go to HVAC team”. Most heating contractors replace air conditioners and furnaces. When existing homes need a furnace replacement, normally the existing duct system and other components are considered satisfactory and they are not redesigned. Therefore heating contractors who only do replacement work are typically not as skilled in full system heating and cooling design and performance. If you are interested in hiring more precise knowledge, choose a contractor who designs the comfort systems for the quality built homes in your community.